The only thing vaguely ‘bistro’ about Kotatsu is the relaxed, cosy ambience it exudes, with shades of light wood contrasted against darker wooden beams. 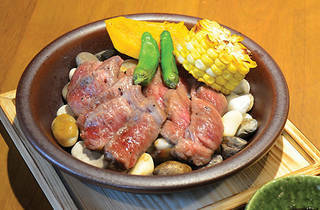 The central focus is the robatayaki bar, where diners can build up an appetite while watching their food being prepared. 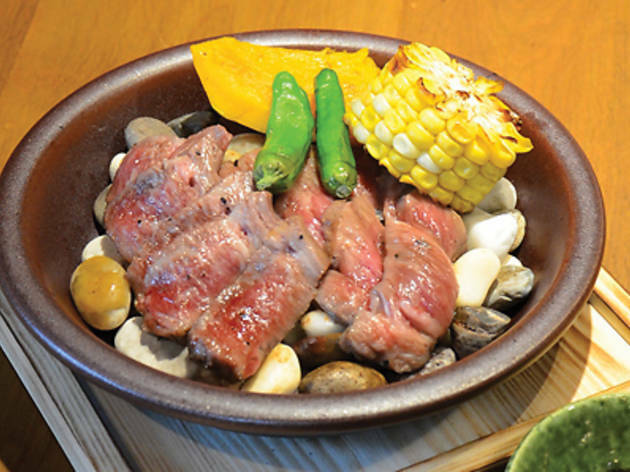 The concise yet varied menu offers delicious, well-presented Japanese fare with an emphasis on robatayaki. Unlike other similar restaurants in Hong Kong, however, Kotatsu offers larger portions that neither leave you hungry nor break the bank (unless you choose the wagyu beef, $288). The spicy cod roe and potato salad ($78) is a delicious and fun start. Boiled potatoes, finely sliced red onion, green beans, diced bacon and spicy cod roe are served with a rolling pin and wooden spoon, so you can mash up and mix your own salad. The chicken meatballs ($68), a personal favourite, are smooth, tender and bursting with flavour, further heightened by the rich egg yolk served alongside. More tasty chicken meatballs are found in the yakitori rice bowl ($78), a meal in itself. Although the chicken legs and wings are a little bland on their own, they thankfully carry a delicate hint of charcoal that pairs well with the sweet, sticky rice and crunchy seaweed. The mixture of sweet corn tempura ($48) is quite a spectacle, served as a stack of delicious, lightly battered strips of onion, carrot and beans, interspersed among juicy pearls of sweet corn. The overly saline shichimi salt is its only let-down. 9 Kingston St, Fashion Walk, Causeway Bay, 3184 0525; kotatsu.hk. Dinner for two: around $750.